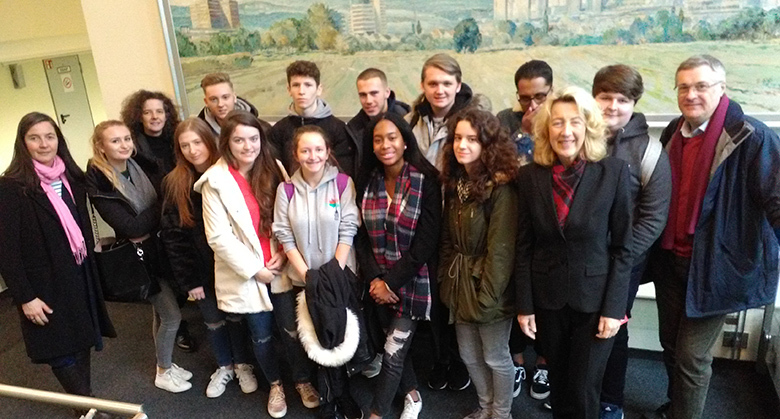 A level German students from The Sixth Form College, Solihull have recently returned from a trip to Solihull’s twin town, as they took part in an exchange with a school in Main-Taunus-Kreis near Frankfurt. Our students were staying with their German counterparts in their homes while on the week-long visit and went to their school, the Albert-Einstein-Schule in Schwalbach. It was the 24th exchange with our partner school, in an association that goes back to 1982. The students enjoyed a range of activities, all aimed towards helping the students improve their spoken German and their understanding of the language and the culture. They were initially received by the Mayoress of Schwalbach, where they had an interesting discussion about Brexit and the integration of the refugees in Germany. Among the activities for the students to enjoy was a shopping trip to the Frankfurter Weihnachtsmarkt (Christmas market) and a ten-pin bowling trip, followed by a meal at an eat-all-you-can Chinese / Mongolian restaurant. During the trip to Frankfurt, the students also visited the Dialog Museum, where they were guided around the pitch black by blind people, giving the students a real feel for how it must feel to be blind. They visited a swimming pool called the Rhein-Main-Therme in Hofheim near Frankfurt which had slides, hot tubs, a heated indoor pool which also went outside and a wave machine all surrounded by tropical plants. They enjoyed a tour of the famous city of Marburg, which has an old university dating back to 1527, where the Grimm Brothers studied for a while. The students also went on a trip to Frankfurt’s Continental headquarters, where they were given a tour of the factory floor and saw ABS systems being built using robots. Continental-Teves is an organisation that the College has strong links with; trainees from this company visit the College to work with our German A level students every year, improving the language skills of both the trainees and our students.